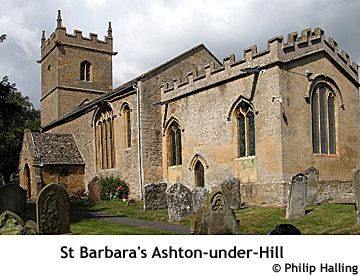 ASHTON under HILL, a parish partly in the upper division of the hundred of TEWKESBURY, but chiefly in the hundred of TIBALDSTONE, county of GLOUCESTER, 8 miles (E.N.E.) from Tewkesbury, containing 301 inhabitants. The living is a perpetual curacy, annexed to the vicarage of Beckford, in the archdeaconry and diocese of Gloucester. The church is dedicated to St. Barbara.